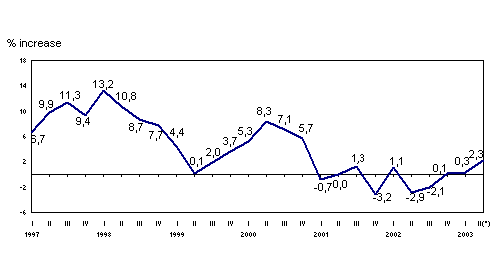 In the first five months of 2003 the General Index of Industrial Production increased by 1.3%. 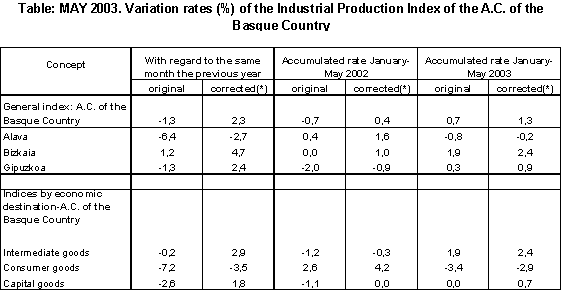 According to Eustat data, industrial production in the A.C. of Euskadi in May 2003 fell by 1.3% with regard to the same month in 2002, as May this year had one working day fewer than the previous year. Once the effect of the working calendar is corrected, in order to compare data in homogeneous terms, the inter-annual rate for May reflects a positive variation of 2.3%. With this data, the accumulated rate for the first five months of the year, in relation to the same period for the previous year, showed 0.7% growth in absolute terms and 1.3% after adjusting the working calendar. In May 2003, the most positive inter-annual variations, in homogenous terms, corresponded to the sectors of “Oil refining” (62.1%), “Metal and non-metal minerals” (39.0%), "Non-metal industry" (5.9%) and "Textiles and clothing " (4.3%). The sectors that underwent the most negative inter-annual growth rates were "Leather and footwear" (-21.3%), "Other manufacture red" (-10.6%), "Food industry" (-9.9%), "Machinery" (-3.7%) and “Metallurgy and metal articles” (-3.5%). According to the economic destination of goods, the inter-annual rate for May 2003 increased in homogenous terms for Intermediate Goods (2.9%) and Capital Goods (1.8%), while the rate for Consumer Goods fell by 3.5%. In the first five months of the year, the highest accumulated increases, in homogenous terms, corresponded to the sectors “Petrol Refinery” (8.7%), "Rubber and Plastic" (6.6%), "Textiles and clothing" (5.9%), "Electric Material" (5.4%) and "Transport Material" (4.6%). More negative accumulated rates, however, corresponded to "Leather and footwear industry" (-16,1%), "Other manufactured" (-8.2%), "Food industry" (-4.3%) and "Machinery" (-0.7%). Accumulated variations for the first five months of the year, in homogenous terms for inter-annual comparison, reflect growth for Intermediate Goods (2.4%) and Capital Goods (0.7%); although not for Consumer Goods which decreased by 2.9%. There are differences when considering the performance of the three Provinces over the first five months of the year in homogenous terms: Bizkaia registers the highest accumulated growth with 2.4%, Gipuzkoa occupies the middle position with 0.9% accumulated growth, finally Alava registered a fall in comparison to the same period for the previous year (-0,2%).